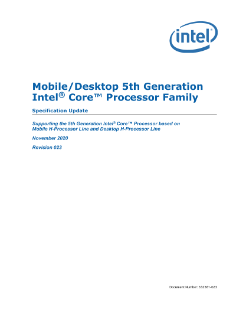 Provides datasheet specification errata, clarifications, and changes for the 5th generation Intel® Core™ processors based on mobile H-processor line and desktop H-processor line. The 5th generation Intel® Core™ vPro™ processor delivers a secure, productive infrastructure for business. Achieve greater productivity, mobility, and collaboration with 6th generation Intel® Core™ processors.